It’s not like there are a ton of beverage options on most flights, so many of us turn to our usual standbys. Ginger ale, for those with queasy stomachs. Club soda, same. Or maybe some tomato juice, made into a Bloody Mary for the less enthusiastic flyer. So it came as a bit of a shock to some frequent fliers when United eliminated some key beverages from its menu in a cost-saving menu. Sure, the loss of Sprite Zero likely inspired some mild outrage. But people went nuts over the loss of tomato juice, so much so that USA Today reports that the airline, in response to customer demand, is now bringing tomato juice back onto its planes. 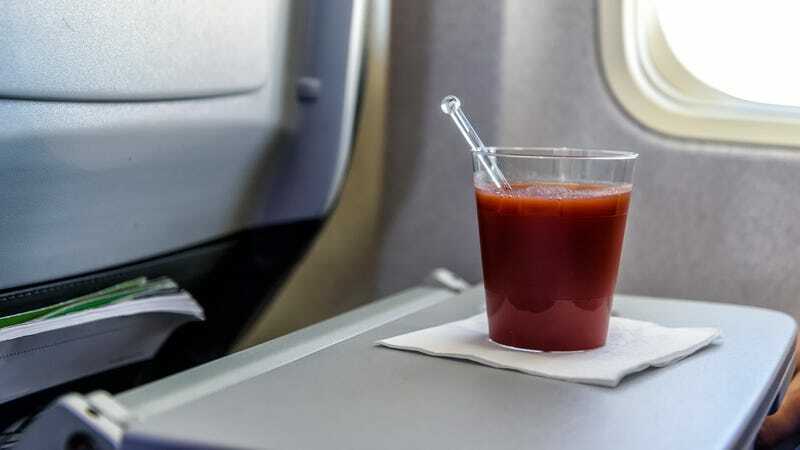 The Guardian offered some theories as to just why tomato juice is so popular on flights. With in-flight food more expensive, it offers a free, appetite-quenching option. It also is a heathy drink, maybe good for those who are using the flight for a chance to detox after a trip to Vegas. Also, a study commissioned by German airline Lufthansa (after it realized it was selling 53,000 gallons of tomato juice a year) “found people enjoyed it more on planes because our taste and smell receptors are less sensitive at altitude, which means people enjoy the freshness of the juice without the earthy, mulchy taste.” For whatever reason, The Guardian points out that tomato juice appears to be as tied to flights as popcorn is to the movies. It was a wise move on United’s part to bring it back. Sorry, Sprite Zero.